The Netherlands is home to one of the world’s oldest and most highly respected systems of higher education, dating back to the 16th century. The QS World University Rankings® 2018 includes 13 universities in the Netherlands, all ranked within the world’s top 400, and an impressive eight of these are within the global top 150. The nation’s highest-ranking institution is Delft University of Technology at 54th in the world, with the University of Amsterdam and Eindhoven University of Technology not too far behind, at 58th and 104th respectively. The country’s oldest and largest public technical university, Delft University of Technology was founded in 1842, and is currently ranked 54th in the world, overtaking the University of Amsterdam as the highest-ranked Dutch university in 2018. 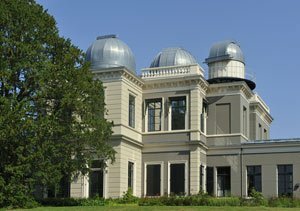 Also known as TU Delft, it teaches about 19,600 students, with a focus on engineering disciplines, computer science, mathematics, applied sciences, and policy and management in technology. Prometheus, a figure from Greek mythology, is an important symbol of TU Delft, and his statue stands in the center of the newly renovated Mekelpark campus. In the 2017 edition of the QS World University Rankings by Subject, TU Delft places within the global top five for architecture. The University of Amsterdam is the country’s largest higher education institution, with around 31,500 students enrolled. Established in 1632, it’s the third oldest university in the Netherlands, and the second highest-ranked, at 58th in the QS World University Rankings. Within Europe, it’s the 15th best university. It teaches undergraduate and graduate programs across a broad spectrum of subjects, with a large selection of English-taught master’s degrees, and a few English-taught bachelor’s degrees. Ranked 104th in the world, Eindhoven University of Technology – as its name would suggest – is especially well-reputed in the engineering and technical fields, and also ranks among the world’s leading universities for architecture. Eindhoven conducts high levels of research, and is located in close proximity to several tech-focused companies, including Philips, ASML and DAF. The university maintains close contacts with many of these companies, and produces almost 3,000 scientific publications, 140 PhD-awards, and 40 patents every year. The oldest university in the Netherlands, Leiden University was founded in 1575 by William I, Prince of Orange, an ancestor of the Netherlands’ monarchy. 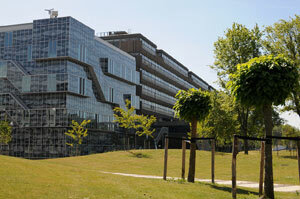 The institution is currently ranked joint 109th in the world alongside Utrecht University. It has around 26,900 students, who study a broad range of subjects from bachelor’s up to PhD level. The university houses more than 40 research institutes and has links with many national and international leaders, including former US President John Adams, two Secretary Generals of NATO, as well as 16 Nobel Prize winners. Established in 1636, Utrecht University is another of the oldest and most prestigious universities in Europe. The QS World University Rankings 2018 place Utrecht University joint 109th in the world with Leiden University and therefore joint fourth in the country. Currently almost 30,400 students are enrolled across the university’s seven faculties, which makes it one of the largest universities in the Netherlands as well. The university claims 12 Nobel Prize laureates among its former students and staff, alongside 13 Spinoza Prize laureates. 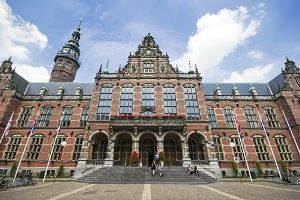 The sixth-ranked university in the Netherlands is the University of Groningen, placed 113th in the world according to the latest QS World University Rankings. Established in 1614, it was one of the Netherlands’ first few universities, and has a long history of leadership, including claims to the country’s first female student, first female lecturer, the first Dutch astronaut and the first president of the European Central Bank. About 27,000 students are currently enrolled, and, like other top universities in the Netherlands, it’s a popular choice for international students. 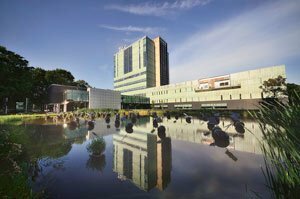 Other Dutch universities ranked among the world’s top 400 include: Erasmus University Rotterdam, Wageningen University, Maastricht University, VU University Amsterdam, Radboud University Nijmegen, the University of Twente and Tilburg University. 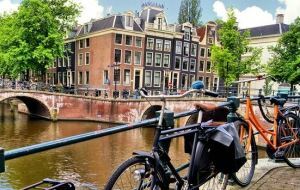 Featured among the world’s top 100 cities for students in the QS Best Student Cities index, Amsterdam is famed for its café culture, liberal attitudes, hordes of cyclists, pretty canals, historic architecture, and the nightlife which makes it a favorite among party-loving holiday-makers. It’s home to a large selection of world-renowned museums and art galleries, including the Van Gogh Museum, and is said to be the perfect place in which to understand the meaning of the Dutch word “gezellig” – roughly translated as “warm, fuzzy, cozy happiness”. In short, Amsterdam is likely to appeal to pretty much everyone. 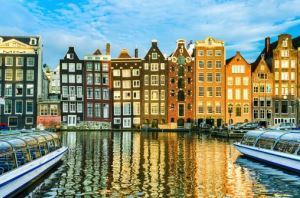 The Netherlands’ capital is home to the country’s second highest-ranked university, the University of Amsterdam (58th in the QS World University Rankings 2018), as well as VU University Amsterdam (218th). Less than an hour’s drive to the south-west of Amsterdam, Leiden is similarly characterized by scenic canals and historic buildings, as well as strong connections with the European art world – it was, for instance, the birthplace of Rembrandt. Much smaller than Amsterdam, the town is much more centered on its student community, which accounts for a significant chunk of the population and ensures a lively social scene. Leiden University is the Netherlands’ oldest university, founded in 1575, and currently ranks at joint 109th in the world. Traveling further towards the north of the country, we reach Groningen, the largest city in this region of the Netherlands – though still relatively small compared to Amsterdam or Utrecht. This is another city with a long history of having students at its center, and today students continue to comprise a significant part of the population and local life. There’s a vibrant cultural scene here, as well as the usual attractive gabled houses and canals, and between 2005 and 2007, Groningen was elected “de beste binnenstad” (the best city center) of the Netherlands. The University of Groningen is ranked 113th in the world. 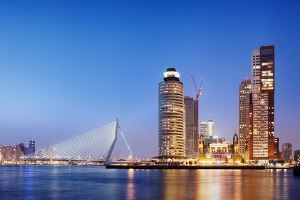 Home of Europe’s biggest port, the Netherlands’ second city Rotterdam stands out from the other cities here due to its distinctly modern feel – the result of damage during World War II, which meant the city had to be largely rebuilt. Its often-striking modern structures make an apt backdrop to its buzzing social scene, famed for music (particularly electronic), nightlife and its multicultural community. 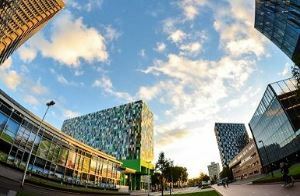 The city is home to Erasmus University Rotterdam (ranked joint 147th in the world), named after the city’s most famous son, the hugely influential scholar Erasmus. Less than 10 miles (or 15km) away is the picturesque town Delft and the highest-ranked university in the Netherlands, Delft University of Technology (54th in the world). In the south of the Netherlands, close to the Belgian and German borders, Maastricht has a cosmopolitan and pan-European character, with multiple languages commonly spoken, a far-reaching reputation as a gastronomic hub, and a history of playing a key role in the development of the European Union. In contrast to much of the country, it even has some hills. Maastricht University calls itself the most international university in the Netherlands, with almost half (49%) of its students coming from other countries, representing over 100 different nationalities. Its overall rank in the QS World University Rankings 2018 is 200. There are two systems for applying to Dutch universities – directly to the institution or through Studielink, an online centralized application procedure. The path you follow will depend on the university and the course to which you are applying. You may even be required to use a combination of the two, so check carefully with the institution. Certain oversubscribed courses in the Netherlands are deemed “numerous fixus”. To get a place on one of these courses, you will need to be successful in a lottery – again, talk to the institution for further details. Tuition will be in Dutch or English, and you’ll need to be able to prove you have a sufficient level of fluency in the relevant language. Tuition fees vary depending on whether or not you are from a country within the European Union. If you are, the average annual fee is €1,950 (~US$2,200), and if not, you can expect to pay between €6,000 and €15,000 (US$6,750 – 16,850). However, there are various scholarship options available. For more information, visit our guide to scholarships in Europe. Depending on your nationality, you may need to apply for a provisional residence permit, known as an MVV (Machtiging tot Voorlopig Verblijf). The Nuffic website has the relevant information. Your host institution will probably make the actual application for you, but you will need to supply all the necessary documents, which must be in Dutch, English, French or German, or officially translated into one of these languages. As well as basic documentation showing you’re actually enrolled on a course, you will need to prove you have €833.22 (~US$940) a month to support yourself. If you want to work while you study, you will need to apply for a work permit, which will allow you to work for 10 hours a week during term time, and full time during holidays. Your employer will apply for this.